Imagination soars at the Mega Bloks First Builders Skybright Airport. 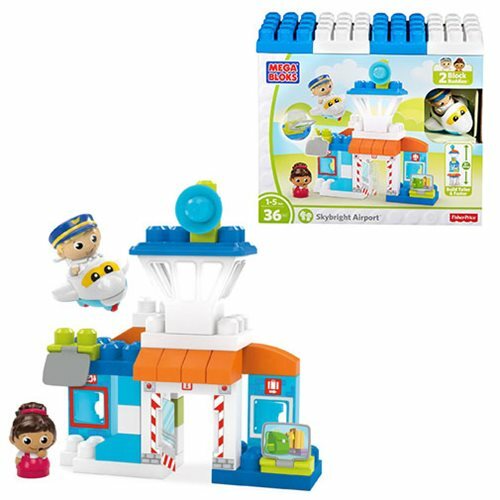 Your little one can take to the skies when they use the blocks, special shapes, and big building panels to create a busy airport full of exciting discoveries! Build the airport, adding the control tower on top. Then, get ready to fly when you roll out the friendly plane, sitting one of your Block Buddies in the pilots seat as the other directs from the tower. Open the airports swinging doors to help your Block Buddies deliver a parcel or pick up luggage. Then, watch curiosity take off when you flip up the special picture tabs to reveal airport surprises. Made for little hands and growing minds, you can rebuild the airport, using the panels to build taller and faster for even more high-flying adventures! Build up to 2-feet tall. Contains 36 pieces. Ages 1 to 5.